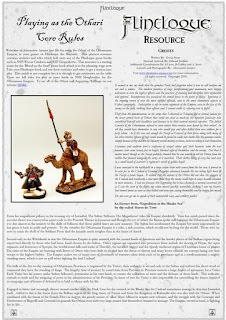 A four page free download for Flintloque players. The working draft of game statistics, tables, special rules, weapons and more for the Othari of the Otharmann Empyre. Click though for more and to download the PDF. Field Camels, Gnolls, Flying Carpets as well as armoured troops armed with twin swords or matchloque jezails. You will need a game book to bolt these new pages upon such as 5024 Escape the Dark Czar or 5025 War in Catalucia and so on. Thanks and enjoy. This is most excellent! Thanks.